Your Improving Rangers Playoff Outlook, Now With One Fewer Injury! 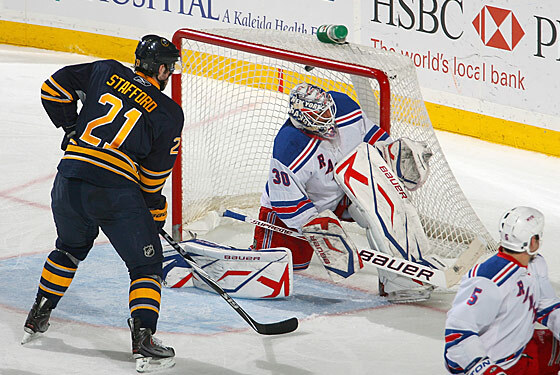 With 14:43 remaining in the second period last night, after Jochen Hecht scored to give the Sabres a 3–2 lead, John Tortorella unexpectedly pulled Henrik Lundqvist from the game, surprising everyone from Lundqvist himself to the MSG announcers to anyone watching at home. Afterward, Tortorella said that he wasn't going to "dissect" the decision except to say that Lundqvist "needed to come out." So we'll dissect the decision for him. First, the aftermath: Alex Auld, Lundqvist's replacement, gave up two more goals, and Buffalo would go on to clinch the Northeast Division with a 5–2 victory. With Philadelphia's win last night, the Rangers' playoff hopes took a major hit: A regulation loss tonight means they can't pass the Flyers, and would also mean that Boston could eliminate them with a win over the Sabres tomorrow. But back to Lundqvist: We suppose we can think of a few reasons why Tortorella would pull his franchise goalie just 5:17 into the second period of such an important game. Perhaps Tortorella thought Lundqvist was simply off his game, and wanted to stop the bleeding before the game got out of hand. But while allowing three goals in a little over 25 minutes isn't very good, it's hard to blame Lundqvist for the third goal, on which he was badly screened by freakishly tall rookie Tyler Myers. Perhaps he was raising the white flag on the game and wanted to rest Lundqvist for tonight's Garden matchup with Toronto, though at 3–2, that wouldn't make a lot of sense. Or maybe he was trying to change the momentum of the game, though calling a time out in such a spot would seem a better course of action than removing one of the main reasons they're still in the playoff hunt to begin with. The morning after, it still doesn't make much sense, though when you're as desperate as they are, we suppose anything goes. To be honest, the Rangers probably wouldn't have won the game anyway. They had trouble all night with the Sabres defensemen joining the rush, and Ryan Miller's spectacular save on Marian Gaborik when the score was still 3–2 squashed any hopes of regaining momentum. It may have squashed any hopes of making the playoffs, too.